When asked to name a famous lake in Italy, for most, the name Lake Como springs to mind. Made famous by the Star Wars film “Attack of the Clones” as a romantic destination on another world – which the main characters run away to for a clandestine marriage – it's certainly easy to see why Lake Como is regarded by many to be Italy's most beautiful lake. When it comes to beautiful lakeside scenery, stunning mountain backdrops and picturesque towns and villages however; the lesser known Lake Garda certainly makes a strong contender for the “most beautiful lake” title. When I last ventured to Italy, I spent a week exploring the area around the lake, making the charming town of Malcesine my base of operations. What stay in the Lake Garda area could be complete without a trip to Venice, the city of lovers and home to some of the most beautiful architecture I've seen; I certainly fell head over heels for this amazing place and found that 1 day just wasn't enough to make the most of what it has to offer. A coach trip from Malcesine took around 2 and a half hours to drive to the nearest point on land, after this a short boat ride across the lagoon gets you to Venice proper so you can explore to your hearts content. Don't miss: Bridge of Sighs, St Mark's Square, Grand Canal, Rialto Bridge, Gondola Ride's & Trips around the lagoon. Whilst staying in Malcesine, it was hard to miss the spectacular Monte Baldo Mountain which borders the lake on its eastern side. An excellent skiing destination in winter and the perfect place to get unmissable photo opportunities of Malcesine and Lake Garda from above. I took a cable car up to the summit from Malcesine and wasn't disappointed with the views which were absolutely stunning. As the cars ascend the mountain they slowly rotate through 360° guaranteeing everyone gets to see the views. What could be better than visiting the city of Verona, fictional home of Shakespeare's star crossed lovers, Romeo and Juliet? For me, one of the best highlights of the trip to Verona was seeing the well preserved Roman amphitheatre and arena which was excavated in the 1800's and restored. If you like your history then you'll love Verona as the city has a wealth of Roman architecture. You can also visit Juliet's house (Casa di Giulietta) which can be found on Via Cappello (the balcony was added in 1936 to attract tourists). A nice old house and a good photo opportunity but beyond that I didn't find this lived up to all the hype. Don't miss: Teatro Romano (Roman amphitheatre), Castlevecchio, Lamberti Tower, Verona Cathedral & Porta Borsari. I'd highly recommend taking the Ferry to Limone and Riva del Garda; I bought a ticket at the dock in Malcesine and got some beautiful views of the lakeside scenery and mountain backdrop as the ferry travelled to Riva del Garda, stopping at Limone (so called because of the lemon tree orchards dotted on the steep hills which are used to make the lovely Limoncello drink Italy is famous for). You'll also get great view of the road tunnels hewn from the rock in the early part of the 20th century; the windows cut through to the outside at intervals make for a weird and wonderful sight as the road meanders along the west side of the lake (the road was also used for the car chase scene at the start of the James Bond film, Quantum of Solace). After taking the ferry I had chance to explore the town of Riva del Garda which is the 2nd biggest town on Lake Garda. If you're staying in a quieter town such as Malcesine, it makes a nice change to visit the bustling and tourist focussed Riva, but you might want to wait until later on when the many tourists have departed on their coaches. 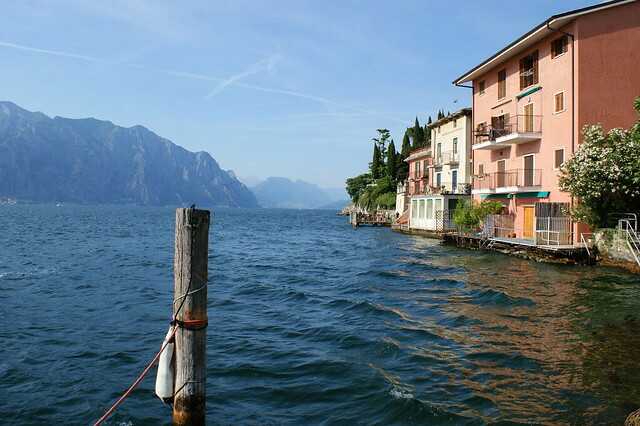 Don't miss: Torre Apponale, Rocca, Riva del Garda Beach, mountain biking & a variety of boat trips. Have family in Riva del Garda and visited for the first time couple of years ago. Nice place, that gives to a bit of the Northern Italian feel, many don’t know about. I went to Lake Como a long time ago (and it was raining the whole time), but this was the first I’d heard of Lake Garda. Italy has many things to offer: from beautiful sites and good food, to nice people and unique paintings. My favorite city remains Florence. Have you visited? Just speaking for myself, not the author (who is off getting married this weekend), I did go to Florence in ’98 as part of my time in Italy, and loved it. I’d studied Italian Renaissance art in college, so I was in heaven. Wow, what amazing pictures. It is absolutely every bit as stunning as Lake Como. Talk about “off the beaten lake”. I loved northern Italy. Another tip, if you travel in the Riva Del Garda area, you must visit Bergamo – the Citta Alta is absolutely stunning! the panoramic rail train journey is fantastic.